Axis & Allies 2-Pack, Base Game + Expansion! It is spring, 1942, and the world is at war. Five world powers struggle for supremacy: Germany and Japan are aligned against England, the Soviet Union, and the USA. You control the military and economic destiny of one of these countries in the titanic struggle that will decide the fate of the world. You will need the perseverance of Montgomery, the daring of Rommel, the courage of Patton, the timing of Yamamoto, and the steadfastness of Zhukov! 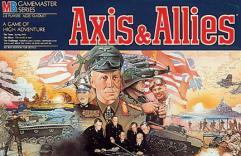 Axis & Allies is a classic game of war, economics, and strategy. Victory goes not only to the team that conquers its opponents on the field of battle, but also to the individual player who seizes the most enemy territory. The blitzkrieg rages; can you stop it? All components combined in the base game box, includes the box for the expansion. The box for the expansion is VG, other components range in quality between VG+ to NM.